For over 30 years, Dave Powers has been a vital part of the Columbus, Ohio music scene as a pianist, keyboardist, and vocalist. Considered one of the most successful musicians in the local spectrum, Dave manages to win over the hearts of all who hear him perform. From clubs and restaurants to corporate events and private parties, his vast repertoire is as diverse as the audience that he entertains. Dave can be seen and heard playing around Columbus and throughout the midwest on solo gigs, as well as with Powerhouse Trio, the Dave Powers Trio, and a six-piece group called “Powerhouse” that provides entertainment for corporate events and conventions. Corporate clients include the Longaberger Company, Huntington Banks, Huntington Investments, Creative Memories, The Limited, and many others. 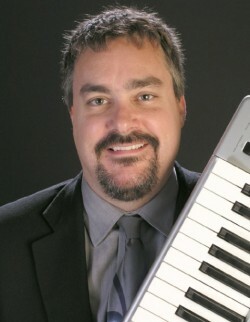 In addition, Dave is associated with the Jazz Arts Group of Columbus, and has performed as a featured artist with the Columbus Jazz Orchestra. He has served as musical director for the late tenor saxophonist Rusty Bryant, Gene Walker’s Generations, and guitarist Wilbert Longmire. In 1998, Dave played and toured throughout Europe, Finland and the Caribbean with trumpeter Arturo Sandoval. Dave is mentioned in the book, “Listen For The Jazz: Keynotes in Columbus’ History” which features musicians who have contributed to the jazz scene in Columbus and nationwide. A partial list of the local and national musicians Dave has played with include: Steve Allen, George Benson, Michael Cox, Tim Cummiskey, Buddy De Franco, Bob Dorough, Eric Gale, Derrick Gardner, Terry Gibbs, Marlon Jordan, Ernie Krivda, The Lancaster Chorale, Jay Leonhart, Johnny Lytle, Mary McClendon, Jack McDuff, Spider Rondinelli, Ali Ryerson, Grover Washington, Jr., Pharez Whitted, and Jeanette Williams. His talents can be heard on a variety of recordings by local music greats Chuz Alfred, Cornell Wiley, Jim Masters, Gene Walker, “Jazz & Eggs”, Don Bullard, and on recordings with guitarist Tony Janflone Jr. from Pittsburgh, PA.
Dave’s first album release was “A Homespun Christmas, ” a home-recorded, self-produced cassette released in 1990. Currently out of print, the tape has been a favorite for many listeners during the holiday season. In 1991, Dave and guitarist/lyricist Andreas Taber released “Andreas’ Fault,” a CD of all-original pop-rock music that contained some jazz and R&B-influenced style. Dave played keyboards and sang all the lead and background vocals. The CD had a nice “slick production” (Columbus Dispatch), but the duo disbanded soon to explore different avenues. Dave continued to work on album projects for other people, putting his own ideas on hold, and continually kept busy gigging. In 1996, Dave recorded and performed on “A Great Big Helping of Jazz & Eggs,” a jam session recorded live at the legendary-now-defunct Marble Gang Restaurant. Sponsored by the Listen For The Jazz Project, the CD represents some of Columbus’ finest musicians, including tenor sax legend Gene Walker. 1997 saw the release of “More Jazz & Eggs,” and a CD by singer Don Bullard entitled “Shades Of Love”, which was recorded, arranged, performed and produced by Dave Powers. In 1998, the Jim Masters Quartet recorded a live CD at Spagio Restaurant, featuring Jim Masters on trombone, Dave Powers on keyboards, Jim Powell on trumpet and Joe Ong on drums. The quartet played every Tuesday at Spagio for 8 years, and Dave’s Powerhouse Trio had been featured for 2 additional years. In the year 2000, Dave finally got back to working on his own projects. He decided to work on two different CD’s at once, making up for lost time. He produced and recorded a live CD with Powerhouse Trio (Dave Powers, Joe Crump, Aaron Scott) called “Live at the Marquee Lounge” where the group played steady Wednesdays for two years. Dave also recorded and produced a studio CD under his own name titled “Listen To This”. Dave comments about this release, “I’ve been wanting to do this for a long time. There are a lot of really great players that have helped me out on this project. Trumpeter Jim Powell, saxophonist Michael Cox, trombonist Jim Masters, bassist Dave Dewitt, and drummers Reggie Jackson (currently with Diane Schuur), Aaron Scott, and Louis Tsamous.” The CD is a definitive representation of the styles of music that Dave Powers personifies, covering straight-ahead jazz, r&b, gospel, and funk styles. The year 2003 brought a third CD release by Dave Powers called “Christmas Collection,” which features the wide variety of styles of Holiday music that Powers performs. “Christmas Collection” also features the talents of special guests Tony Janflone, Jr., Michael Cox, Reggie Jackson and Jim Masters. In 2010, “The House Jazz Concert Series, Vols. 1 and 2” were released, documenting live performances given at Dave’s home for an enthusiastic audience. In 2009 Dave started a monthly house concert series of jazz music with special guest performers playing to 50 to 85 people whoo attend. The performances were recorded, and the “House Jazz” CD’s represent the best of the best. Dave’s CD’s can be purchased online at CDbaby.com, amazon.com, or downloaded from 30 different digital music networks including iTunes and Rhapsody.